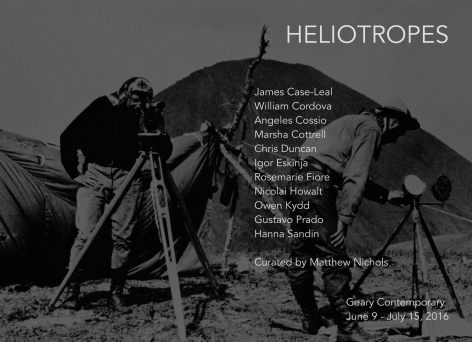 Geary Contemporary is pleased to present Heliotropes, a group show curated by Matthew Nichols that features work by James Case-Leal, William Cordova, Angeles Cossio, Marsha Cottrell, Chris Duncan, Igor Eskinja, Rosemarie Fiore, Nicolai Howalt, Owen Kydd, Gustavo Prado, and Hanna Sandin. The exhibition will be on view from June 9 to July 15, 2016. An opening reception will take place on Thursday, June 9, from 6 to 8 PM. In some of the works on display the sun appears in familiar pictorial guises – as a disc, an orb, a spray of radiance. In the hands of other artists, the sun is referenced obliquely, through its manifold effects on our terrestrial realm – warmth, illumination, rotation, nourishment. The formal and metaphorical range of the works is wide, and is matched by a diversity of materials and processes, including novel approaches to painting, drawing, photography, and sculpture. As such, Heliotropes not only confirms the obvious centrality of the sun to our earthly existence, but also speaks to its otherworldly resistance to full comprehension and singular representation. Matthew Nichols is Associate Professor of art history at Christie’s Education, New York.